Three of the attribute selectors in the CSS3 spec allow you to check the value the specified attribute for a string match. These attribute selectors are referred to as substring matching attribute selectors. These can open endless possibilities, so I think it’s useful to have them in mind. And as a bonus, these selectors have strong support as far back as IE7, so pending thorough tests I think they are quite safe to use in many current projects. Here’s a brief outline of each one, with some examples. This one uses the caret (^) character to tell the browser: “If this link has an href attribute that starts with http://, make it green.” Now, this specific example looks like an easy way to target external links. But be careful, because if your CMS is adding your site’s URL to the beginning of certain links (like WordPress does), or if you’ve built your site with a “path” variable prepended to all links, then this would target all links that begin with “http://”, regardless of whether they are external or not. So this example might work only in specific circumstances. But even this is not perfect, because it doesn’t target “https”. So testing is crucial. Nonetheless, this clearly illustrates what this attribute selector does, so you can use it where you think it fits. Another important note: Don’t confuse this one with what’s been commonly referred to as the “language” attribute selector, which uses the vertical pipe character (|). That attribute selector will only match the specified string if it is at the start of the value and if it precedes a hyphen. This one is commonly used for matching values in the hreflang attribute on links. This selector uses the dollar sign ($). Now we have what looks like a fairly reliable matching process. We know that all anchor elements that point to PDF documents are going to have the extension “.pdf”, so with this code we can add some right padding to those links and add a PDF icon to the link’s background. Finally, this selector targets elements based on any string match within an attribute value. So the specified string could occur anywhere in the value, not just at the beginning or the end. 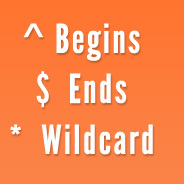 The asterisk character (*) is well-known in computing as a wildcard character, so this one’s easy to remember. The example I’m using may remind you of how WordPress sites attach a number of classes to specific elements, often with prefixes like “post-“. This might not be extremely practical, because usually there is another primary class with which to target the element. But again, it illustrates what can be done, and the type of values you’d be targeting with the wildcard character. Depending on how you build your app, your markup, and how you define certain attributes, the sky is really the limit with these selectors. I’d be glad to hear of any practical ways anyone has used these in their projects. found this very helpful, many thanks! This is problematic with URLs like http://someservice.com/recommend?url=http://domain.com (which are invalid, but still widely used). Good point on the improper matching of those invalid, but widely used, URLs. I see no easy way of excluding those, which means you’d have to list out every combination of http or https and any valid sub domains to exclude or include. Perhaps there’s a way I’m missing, but without wildcards I can’t think of how to exclude the URL as a parameter scenario. Use case: different style for external links. Sometimes even showing the favicon of the website the link leads to – example. Also displaying PDF links etc with a little PDF icon, word icon etc etc. I’ve found attribute selectors and substring matching quite useful for SEO and HTML debugging purposes. For example you can target images without or with empty alt attribute (img:not([alt]) and img[alt=""]) or links with rel=nofollow (a[rel*="nofollow"]).